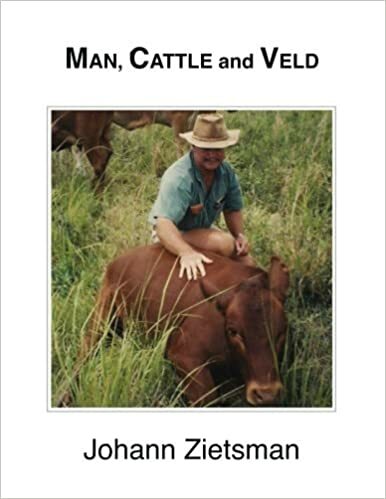 Man, Cattle and Veld by Johann Zeitsman records the journey of one of South Africa’s foremost cattleman from a practitioner of the disastrous range management methods of American and African universities to a practitioner of Allan Savory’s range management principles and, eventually, a pioneer of mob grazing. Zeitsman criticizes the ranching community for its many destructive practices including dips and de-wormers which breed poison-resistant parasites, and, harm the environment by killing dung beetles and other beneficial insects. Instead he says we should be developing parasite-resistant breeds, which would have included all African cattle before the African “experts” adapted European husbandry methods. He excoriates feeds, center pivots, calf meal, poisons, low stocking rates, bush and weed eradication, burning of moribund grasses as “man versus nature”, which actually plunders biological capital. According to Zeitsman, the proper objective of any rancher should be maximum sustainable profit per acre because the “per animal production” metrics completely ignore profits. “Cattle” is the book’s longest section and also my favorite. Here Zeitsman expresses his physiological theories through the prism of economics and his conclusion that nature’s way will always make the most money. Cattle are integral to the ecosystem. In his analysis, the smaller and heavier the cattle are, the better—for many reasons to which he devotes 70 pages. He offers a comparison between 25 cattle breeds, broken down generally between Bos taurus (European) and Bos indicus (India-Africa). I found this enlightening and had no idea the African breeds are so diverse. He advocates planned grazing concepts pioneered by Allan Savory. His cattle recommendations are based on which breeds perform best under ultra-high density, or “mob grazing” (the Australian term) of which he was an early pioneer. Mob grazing puts very large herds on small areas for short periods and requires cattle that thrive under such “competitive” conditions. Generally, these aren’t the European breeds. He says ranchers should focus on breeds that exhibit parasite resistance and reliable reproduction combined with an ability to tolerate high concentrations and almost continuous herding. Zeitsman maintains that because profitability is a function of total return not individual animal performance, it is a big mistake to measure productivity according to an animal unit instead of a land unit. Smaller animals are a better choice. They mature faster. The same range will support and produce more pounds of beef using these animals. Big, inefficient animals may look pretty and ultimately gain more weight but require costly feed, antibiotics, parasite medicines, hormones and longer growing periods to do so. “Veld” centers on what we Americans call rangeland. This section showcases his philosophy, which simply stated is: ranchers should mimic nature. He supports this supposition with many direct and anecdotal insights. This is a book about animal impact and nonselective grazing. Its conclusions and recommendations are driven by the real world implementation of these concepts, which will be familiar to wildlifers who view cattle as a substitute for nomadic large grazers such as bison in systems that evolved with huge animal numbers. In this last section there are a lot of good, practical ideas on how to do things like using electric fences, planning your grazing, and applying concepts of planned grazing according to the specific climates and habitats which can vary so widely across African grasslands. All of this readily translates to North America. In order for grasses to stay vigorous and palatable, they must be severely grazed at intervals that allow sufficient recovery. This is particularly true of grasses that coevolved with severe grazers and that have growth points close to the ground. Most environments have grasses of varying palatability, where even utilization can only occur at high stock density and total utilization. I agree that the foregoing describes the perennial challenge of selective grazing where a single species—cattle—is the only grazer. Non-selective, ultra-high density grazing deals with this physiological need as does what we do at Circle Ranch. We maintain a dozen other large grazing species to overlap with and compensate for selective grazing by the cattle and to reach areas, particularly in the mountains, where the cattle can’t or won’t graze. The hooves of any hard-hoofed animal can either compact or loosen soil depending on stock density and time. 1 cow X 365 days is not the same as 365 cows X 1 day. Frequent moves result in improved utilization and a lower drop in body condition because of competition, fresh, nutrient-dense grazing, offering a more even plane of nutrition and a more stable complement of rumen microbes. Cattle grazed in ultra-high densities will drastically increase their browse intake. Why? In response to grazing, browse develops tannin, which tastes bad to cows, but tannin development takes time. A massive herd does its browsing quickly before browse and forb plants can develop their defensive tannin. Under these circumstances, large, concentrated herds can help control brush by eating it before tannin develops. Only through concentrated grazing can we put the litter and dung on the ground necessary to feed earthworms and dung beetles, two species directly responsible for soil health. We can increase soil fertility without fertilizer because all of the ingredients of fertile soil are freely available in the ecosystem. We have only to enhance these processes by managing appropriately. In East Africa, as nowhere else in the world, there is an ancient interaction between humans and their herds, because here, cattle depend on humans for protection against predators. Consequently they have developed a strong affinity for man and have an inherently strong herd instinct, which makes herding much easier. Such traits make these cattle ideal for improving the land where the primary objective is enhancing wildlife habitat as opposed to the maximizing beef production. Zietsman, with the bluntness for which Rhodesians are well known, examines reasons that mankind persists with destructive ranching practices as well as the reasons universities, agencies and professional breed organizations resist adopting better ranching practices. Here are a few “politically incorrect” observations regarding researchers, range professors, breed show judges and breed inspectors. In nature, interactions are non-linear and unpredictable. We cannot manage natural systems from a mechanical perspective as currently attempted. In nature, one plus one does not equal two. The reductionist approach is inappropriate. It is better to know a little about a lot than a lot about a little. Advanced range education is characterized by specialization. More and more is learned about less and less until the student knows a lot about very little. Professional academics eventually know everything about nothing and nothing about the greater whole—the grass-grazer-predator relationship—which is the minimum ranchers can work with. It is better to know less about more than more about less. Predators are essential; they change grazing impact from bad-for-range without predators to good-for-range with predators. Studies about enhancing natural processes are essential but scarce. Intervening in natural processes leads to quick fixes but the price paid in the longer term is very high and unacceptable in terms of environmental damage and related problems. Most research is interesting but irrelevant. Much research is absolutely useless. How many agricultural scientists, each specializing in nutrition, pastures, physiology, economics or genetics, realize that their specialized knowledge has very limited application in a “whole” consisting of a myriad of nonlinear interactions? The important is made irrelevant; the irrelevant is made important; and [livestock] judging is, by virtue of its nature, concerned with the superficial. Due to the emphasis that breed societies place on appearance, without appreciating the limitations of visual appraisal, there is a total reversal of the value of traits relative to productivity. Whether you are a conservationist, wildlife advocate, cattleman or someone wishing to advance restoration ecology, do yourself a great service and read this book. There are two versions, black & white and color. The full color version is well worth the extra money. Johann Zietsman, is a renowned grazier and livestock breeder from Zimbabwe. He studied livestock under noted livestock researcher and author Jan Bonsma in Pretoria, South Africa, and is a Holistic Management practitioner mentioned in Alan Savory’s book Holistic Management. He is acknowledged by Mr. Savory as the first person to use Ultra High Stock Density. His practical knowledge of both grazing and livestock is very unique. Great book. One of the “must reads” for anyone in the cattle business. Sometimes it is a bit hard to comprehend at first, but if you slow down, pay attention and think about what he is saying, it is well worth the effort. Yes the Rhodesians’ syntax is a little hard for American speakers to follow. Same with Allan Savory. Something to remember is that both see animal impact coming (as a practical matter) from cattle alone. And so wildlife advocates need to think about using animals other than cattle to overcome the problems of non-selective grazing, where ultra-high density cattle (‘mob’) grazing is not practical, such as at Circle Ranch. He did not mean to write a wildlife book, but these principles are very important for wildlife and wildlife habitat. For decades now the traditional range “experts” have denied that cattle grazed under these holistic methods can benefit plants. The ultra high density (“mob”) grazing is now so widely practiced, and the results are so indisputable, that there’s little left to argue about except what is the best technique. Which does not mean that the researcher and academic communities have conceded. As a “wildlifer” I say to these same people that they should read this book and apply these principles to wildlife and habitat management. Again we can debate best methods, but not the basic rules: Our deserts need periodic grazing from large animals like bison or cattle, many many prey species weighing 300 pounds or less, and lots and lots of predators. Pull out any one of these and the systems come apart. The “experts” attack all three: I do not know of a single wildlife agency that sees cattle as necessary to the health of rangeland, and, all practice removal of predators and prey to help favored species. The use of poisons against plants and animals is increasing especially in Texas. Those of us who are applying these principles are the true experts. And, here is the good news: Restore grazers, predators and prey, and the systems recover at a phenomenal rate.